Promotion celebrates parents and their little ones’ chompers with daily giveaway prizes focused on the chewing milestone! 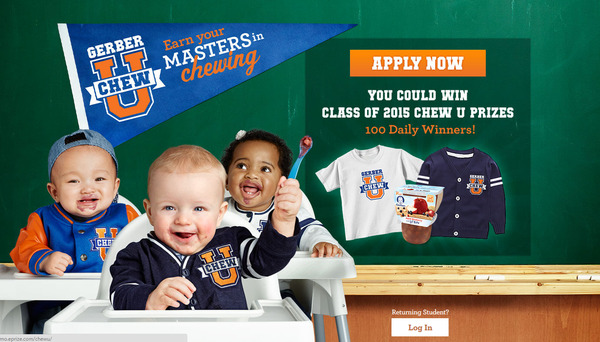 FLORHAM PARK, NJ (July 21, 2015) – Gerber announced this week that they are offering parents an open enrollment in the digitally created “Chew University,” an online experience that celebrates the chewing milestone with daily prizes and resources for parents. Chew U was founded in partnership with Gerber’s newest product launch, 3rd Foods® Lil’ Bits™ recipes, which are made with perfectly sized soft pieces of fruits or veggies to help babies learn how to chew. Chew U will take babies on a journey and arm them with the tools needed to earn their “Masters in Chewing” which is an exciting milestone for parents too! Parents can also create a student ID card for their little one and enter to win prizes on a daily basis, from t-shirts, cardigans and coupons to a “graduation diploma.” This is a limited-time promotion for parents so don’t miss the chance to celebrate your baby’s chompers! To access the promotion, official rules and to learn more go to Gerber.com/ChewU – the site will be active from July 6 to September 4. Gerber welcomes chewers at all levels to enroll in Chew U! Parents can share and follow along with other chewing scholars on social media by using the hashtag #GerberChewU. Nestlé Nutrition, part of Nestlé S.A., is a world leader in nutrition, health and wellness. Gerber Products Company, founded in 1928, officially joined the Nestlé Nutrition family in 2007. Nestlé Nutrition and Gerber’s combined resources and scientific research expertise have enabled the company to become a worldwide leader in early childhood nutrition. Gerber produces more than 400 food products, all of which are a part of the proprietary Gerber® Start Healthy, Stay Healthy™ nutrition system. The Gerber® Start Healthy, Stay Healthy™ nutrition system combines products, educational resources and services that are designed to encourage the early establishment of healthy eating habits in children from birth to preschool.